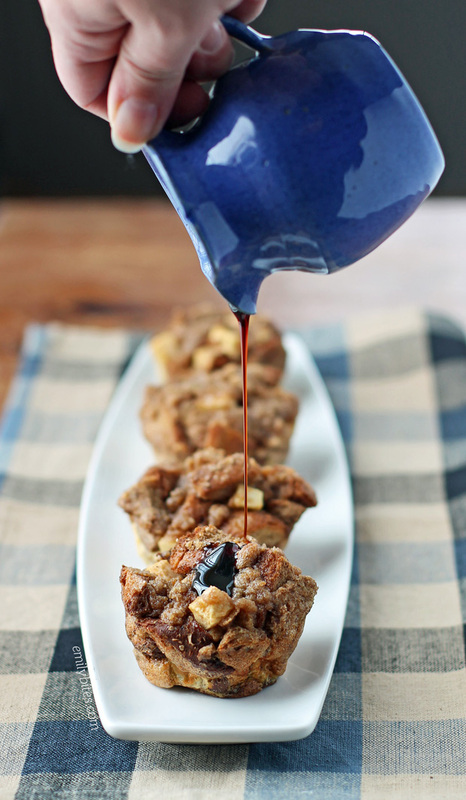 French toast is one of my favorite breakfasts, and French toast casserole is even better, so these Apple Streusel French Toast Muffins are rocking my world right now. 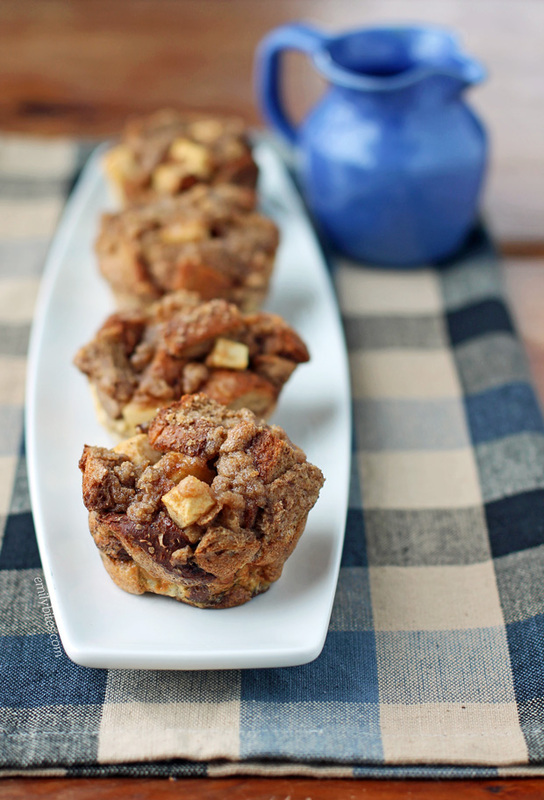 Cinnamon French toast with warm apples and a crumbly brown sugar topping, baked into perfect grab-and-go muffins? Perfection. I actually had a reader request a French toast casserole with crumb topping recently (hi Kelly! ), and since muffin tin breakfasts are my favorite, I muffin’d it. Plus, this doesn’t even need to rest overnight like a lot of French toast casseroles. The bread soaked the liquid right up! You can eat these as-is (I did, they’re amazing) or drizzle them with maple syrup, chocolate syrup or other breakfast syrups if you prefer. As an added bonus, each muffin is only 116 calories or 3 Weight Watchers SmartPoints! Looking for more tasty and portable breakfasts you can make in your muffin tin? Try my Pear Gingerbread Baked Oatmeal Singles, Mini Dutch Baby Pancakes, Blueberry Baked Oatmeal Singles, Sausage Egg and Cheese Hash Brown Cups, Pumpkin Chocolate Baked Oatmeal Singles, Lemon Blueberry Muffins, Bacon, Egg and Cheese Biscuit Cups, Banana Chocolate Baked Oatmeal Singles, Banana Pancake Bites and many more in the breakfast section of my recipe index! In a large mixing bowl, whisk together the eggs, egg whites, milk, vanilla extract, sugar and cinnamon until combined. Add the cubed bread pieces and stir together until the bread has soaked up the liquid in the bowl. Stir in the apple cubes. Spoon the mixture into the prepared muffin tin press down lightly on each to form them together. In a small bowl, combine the butter, flour, brown sugar, pinch of cinnamon and pinch of salt. Use your hands to mash them all together into crumbs. Sprinkle these crumbs over top of the bread mixture in the muffin cups. Place the tin in the oven and bake for 25 minutes until the French toast muffins are cooked through and the tops are golden. When I saw this post today, they looked so good, I couldn’t wait to make them, so I made them for dinner with a side of apple chicken sausage. These were amazing and super easy to make! Love apple and cinnamon. Sounds good!! Can these be made ahead of time & warmed up when ready to be eaten? Yup, I’ve been eating the leftovers! These look great! I’m thinking about making these tonight. How long do you think they will stay good and what is the best way to store them? Fridge? Freezer? Also, how long do you heat the leftovers? Thanks! I put them in the fridge and we ate them for a few days. I haven’t tried freezing them, but I assume they would freeze fine. I’ve either been microwaving my leftovers, reheating them in our toaster oven, and even just eating them room temp or cold, so it really just depends. A lot of these sound good but do you have main courses/ crock pot/ or deserts that don’t take a ton of ingred. or a lot of time? I work full time and have trouble preparing things for dinner that call for things I don’t keep in the house (Bay leaves, cream of tartar, fresh herbs… or things that just take a ton of items and loads of time to prepare. Hi Emily! Thanks so much for sharing all of your recipes! I can’t imagine how much work you put into this website!!! All of the recipes I’ve tried so far have been great! Thanks again! Do you happen to know how many sp per slice in the bread you use? I use Sobeys Weight Maintenance bread that is 3 sp for two slices and am wondering if the sp would be the same for the recipe with my bread. Emily, thank you for this delicious recipe and so many others. I am on WW and your site has been a great help, and fun too. I just made these Apple Streusel Muffins for the second time. They are in the oven as I type. When I make the crumb topping it doesn’t get lumpy, it ends up more like a frosting. The muffins still taste great, just wondering if you have any suggestions on how to get the topping to be more crumb-like. Thanks again for all that you do!